It can be incredibly frustrating after a busy day at work to get home and realise you haven’t got anything ready for tea. The temptation is to throw some fish fingers on a baking sheet and serve with some frozen chips. The kids will probably love it. However, no one else in the house will thank you! The other option when you’re in a hurry is a shop bought ready meal, which generally comes in a super small portion size, leaving you and your family unsatisfied and nutritionally defunct! Wouldn’t it be great to have on hand some healthy home cooked meals ready to defrost and stick in the oven or microwave when life has thrown you a dodgeball? We’ve got some fantastic tips in our batch cooking for beginners guide, to help you start on your journey to batch cooking and freezer cooking meals. 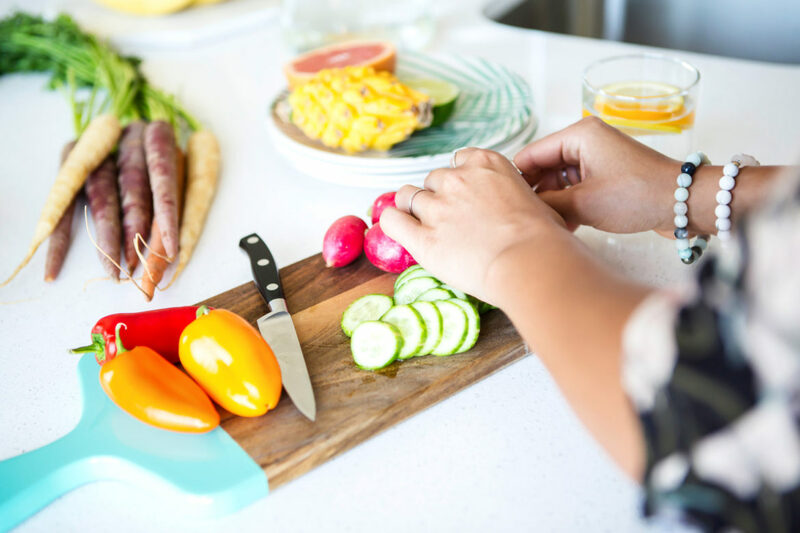 We’ve made the steps simple to follow, and you’ll find that most of them are something you are already doing most days, you may just need to tweak your cooking skills to help you to freeze larger portions of the healthy meals you’re already cooking for your family. In this post, you will learn how to batch cook and freeze your weekly meals and how to make a batch cooking meal plan. We will talk you through batch cooking for families and some healthy meal ideas. and you can download our monthly meal planner if you wanted to try monthly batch cooking! So, without further ado lets ditch the oven chips and learn how to prepare some easy freezer meals for the whole family, let’s start batch cooking for beginners! Food processor (optional) for chopping large portions of onions and for grating. This post contains affiliate links which when clicked may mean that I receive a small fee. Batch cooking is a simple way to prepare all your weekly or monthly meals in advance. By cooking more than one portion at a time and freezing them, you can thaw and use a different meal portion every day as a healthy meal when you want to save time , and is a much better alternative for your family than shop bought ready meals and tomato sauce which can often be high in salt, sugar and other additives. What are the benefits of batch cooking freezer meals? Batch cooking freezer meals allows you to have a ready cooked homemade dinner available whenever you need it. Homemade meals are far healthier than store-bought ready meals as you are in control of everything you add to the dish. You can adjust your meals to suit your family’s dietary requirements, such as nut allergies, gluten and lactose intolerance. You can avoid salt, sugars and other unhealthy preservatives and additives. You can hide blended vegetables into the sauces of most healthy freezer meals to ensure your kids are getting extra portions of vegetables at every meal. In my post meal planning for beginners, I discussed how to create a meal plan for all your weekly meals. Hopefully, you’re now well on your way to getting organised for your family meal planning. You could catch up here if you missed it. In this post, we are going to take it to a whole other level; we are going to discuss how to fill up your freezer with healthy portions of homemade freezer meals so that you can reap the benefits of a healthy freezer friendly family meals every day! And the great thing is, it’s straightforward to execute! Follow these simple steps to once a month meals. Decide whether you would prefer to make extra portions when you are preparing that meal for dinner or whether you would prefer to spend an afternoon cooking all your meals for the week or month. Check you’ve got space in the freezer as you will need to put those freezer meals somewhere! Make sure you’ve got labels (download my free freezer labels by clicking here ) and suitable meal prep containers to fit enough food in for a family portion, and single servings too. The rule when batch cooking for families is to check to see how many weeks are in that month and multiply the ingredients by that many weeks. So, for instance, if I usually use a 1x 400g tin of chopped tomatoes in a spaghetti bolognese portion and there were five weeks in the month, I’d put five tins of tomatoes on my shopping list. I find it easier to cook an enormous big batch of one meal and freeze it, than spending a whole afternoon preparing a month’s worth of meals, but you do whatever you find suits you best. Cooking one freezer meal at a time will take longer to build up a stock of dinners but is less time consuming to prepare, and it makes shopping for ingredients is simpler too. 6. Make sure you have ample sized pans or a slow cooker big enough to batch cook the food you’ll be preparing. The best meal prep containers for batch cooking. Frozen meal batch cooking ideas. Add your favourite meals to your list, try to make meal planning as simple as you can at first until you get used to batch cooking, once you’ve got comfortable with the whole process you can start adding more adventurous meals! Here is my family’s favourite healthy meal spaghetti bolognese, you can download the printable version here to get you started on your meal planning and freezer meals journey! Remember to adjust the ingredient amounts accordingly! Replace the meat with Quorn for a healthy vegetarian spaghetti bolognese. The general rule I follow for batch cooking is to make 4-5 x more food than you would for one family meal. Here is 1.5lb of stewing steak I used to cook five portions of beef stew. Before you know it, you should have a full month’s meals made in advance! It can be expensive to buy a lot of meat when you are batch cooking. So it’s a good idea to bulk out your meat dishes with some good fillers, my favourite way to do this is to add some beans or lentils to the recipes I make, beans and pulses are high in protein, fibre and keep you fuller for longer, they are also super cheap! I use tinned beans for convenience and dried lentils as they do not need to be soaked overnight! I usually add one tin of beans per dish of food and approx 1 cup of lentils per meal. Lentils are perfect for curries, chilli, lasagne, soups, and bolognese. How to make vegetarian freezer meals. Whether you’re a vegetarian, like meat-free meals or have friends who are vegetarian, it’s always a good idea to have a few vegetarian portions ready in the freezer for when the need calls. There are many ways to tweak your usual meat dishes into vegetarian options. Use meat substitutes such as Quorn. You could also freeze your meals in freezer bags and freeze them flat, which helps them defrost quicker and fit better in the freezer. I like to use these IKEA bags for my freezer bag meals as they are sturdy, come in multiple portion sizes and they are also great for snacks! You can grab them here! I usually use these if I’m a little short of space in the freezer. I like to use my slow cooker to batch cook most of my family’s freezer meals, as it allows me to batch cook while I’m at work or out with the kids! Make sure, if you are looking to buy a slow cooker or crockpot to think about getting a 6.5-litre size like the one below to ensure you can make a huge batch! Download our free printable freezer stickers today; I have designed a vegetarian style sheet of labels too, to make your vegetarian and vegan meals instantly recognisable in the freezer! What are your go-to dishes for too tired to cook nights? I am vegetarian so I like anything with a delicious tomato sauce, so my go-to meal would be pasta made with my own easy healthy homemade sauce which you can find by clicking here I usually freeze my sauce in single portions for either myself or the kids, I use this for pasta, beans, casseroles and soup, it’s low in fat, low in sugar and low in salt, so perfect for the whole family for a quick healthy meal! I hope you found this batch cooking guide for beginners helpful, if you’d like more of our weekly updates and free resources, leave your details below! Subscribe to our updates and receive the exclusive code to unlock our amazing resources library chocca-block full of free printables! Want my FREE checklists, labels and weekly updates? I haven’t tried batch cooking yet. This guide is so great and comprehensive. I’m willing to give it a try! Thank you, I’d love to know how you get on!